This is looking to be a very good year for crane viewing. Crane numbers continue to rise this season and we spotted 555 cranes coming in to roost at Haehnle Sanctuary tonight. Visitors were treated to about a dozen groups of cranes flying directly above the Harold Wing overlook. They were close enough for us to hear the call of some juveniles. The colors were good, but muted due to the cloudy sky. We did have about 30 minutes of direct sunlight and later the low sun lit the tops of the clouds with pinks and purples. In the 6 o’clock hour we had two separate steams of thousands of blackbirds coming in from the east and passing in front of us and reaching all the way across the marsh to the west. The first stream was well over a mile long. They traveled to a location where we normally see a lot of blackbird activity. But tonight the sky was boiling with activity. We continue to get Great Egrets coming in to roost. This Saturday we will be having our annual Cranes, Colors, & Cabernet Festival at Haehnle Sanctuary starting at 1200. And we are celebrating the 65th anniversary of the Sanctuary. Come out and joins us! 162 Sandhill Cranes came to roost for the night in the Haehnle Sanctuary. There were 29 cranes that flew past looking for some where to spend the night. Water levels look favorable for a good season of roosting, and the cranes seem more confident coming in than they were last year. The sky was cloudy this afternoon, with only a few patches of blue breaking out. Some sunlight peeked through the openings to cast a bit of gold on the marsh, but overall it was muted. 50 visitors came out to view the cranes coming in and enjoy the mild evening. It was still warm enough for a few mosquitoes, but at dusk we were helped by a bat (probably a big brown) who was feeding and hopefully ate a few dozen. Our weekly count continues to increase, albeit slowly. In addition to the 88 cranes landing in the marsh, 14 were fly-bys who sought another venue for the evening. We’re hoping to break 100 next week. Thirty-three visitors were treated to a spectacular afternoon at the Phyllis Haehnle Memorial Sanctuary. 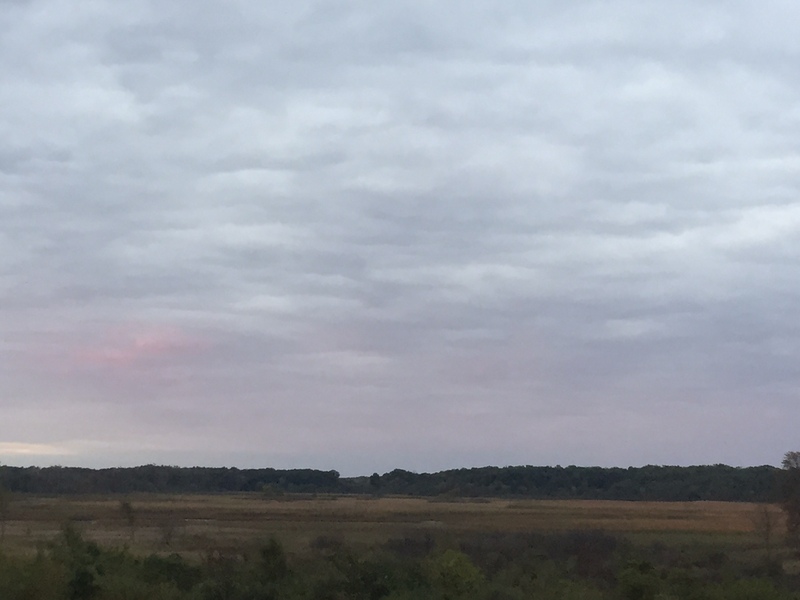 As the sun was setting, the sky over the Mud Lake Marsh changed from golden yellow to deep purple and finally to deep red. Many species of birds were tallied for the day and they are listed below. Of note were 9 Wilson's Snipe that flew past the overlook and 2 Greater Yellowlegs were heard from the overlook. 68 Sandhill Cranes come in at dusk to roost in the marsh. We had a beautiful day for the first count of the season. As always the setting sun put a golden patina on the marsh. Several Great Egrets looked a pale blue as they came in to land, then turned white before then dipped below view. Forty-eight egrets were counted but most of them left the sanctuary and headed north before sunset. Notable species included a Common Nighthawk and 9 warblers found by Don & Robyn walking the trail and the marsh. We also had lots of raptor activity with four Northern Harriers (most immature), a Bald Eagle, several Red-tailed Hawks, and lots of Turkey Vultures to remind us to keep moving while we watched for cranes. 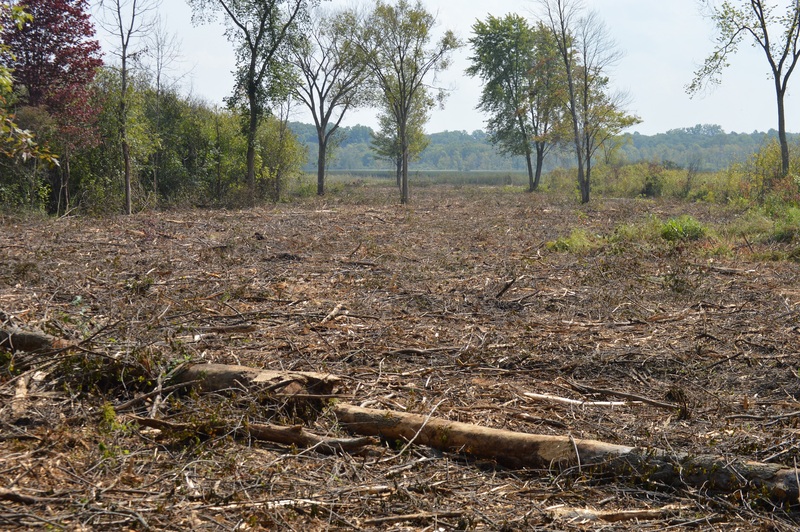 We have begun a project to remove the large stand of invasive Glossy Buckthorn that surrounds the fen at Haehnle Sanctuary. 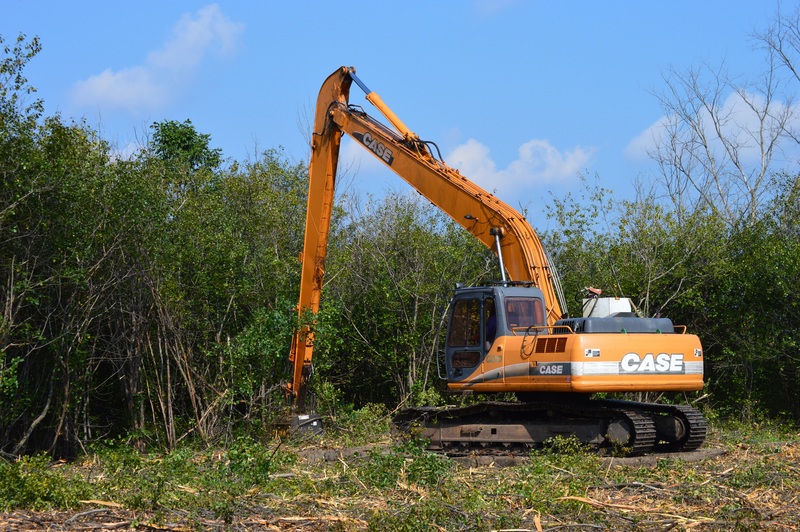 Under a program managed by the US Fish & Wildlife Service, equipment has been brought on site to start the eradication of an old stand of buckthrons. Tom Eitniear of the USF&WS has brought in Dennis Marshall to mow down these invasives. They will work on this another few days this year, but only a portion of the stand will be removed this year. This project will continue for the next several years. For videos, see our JAS YouTube feed. Form this morning's visit to the Burke Lake Banding Station. The highlight of the morning was the capture and banding of a young mourning warbler. Here is photo of him in the hand of one of the interns at the station just before he was released back into the wild. 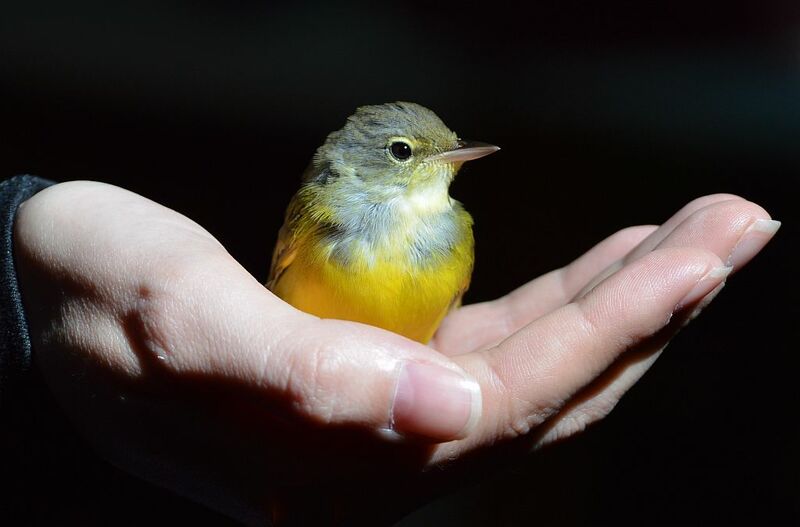 The photo brings to mind a play on words to an old cliché: "A mourning warbler in hand is better than two in the bush." Doug has shared some photos from Tuscon, AZ on Friday, August 7th. 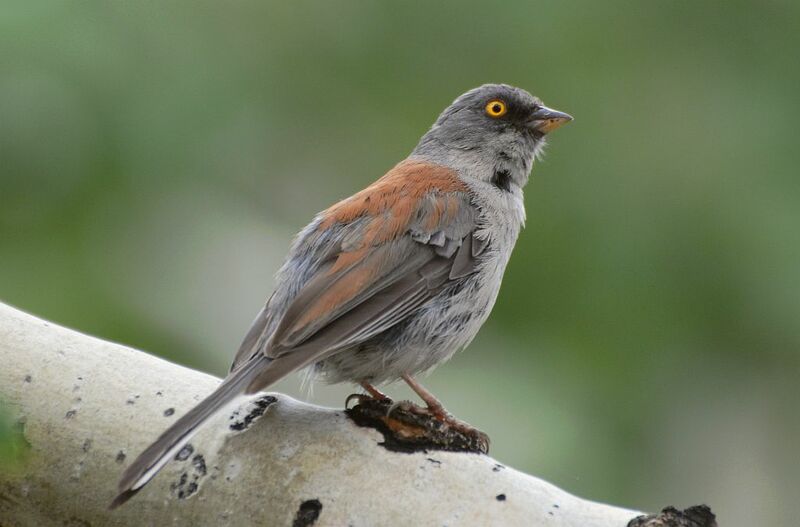 The hummingbirds, the Steller's jay and a yellow-eyed junco were photographed by the Iron Door Restaurant at the summit of Mt. Lemmon, near Tucson. 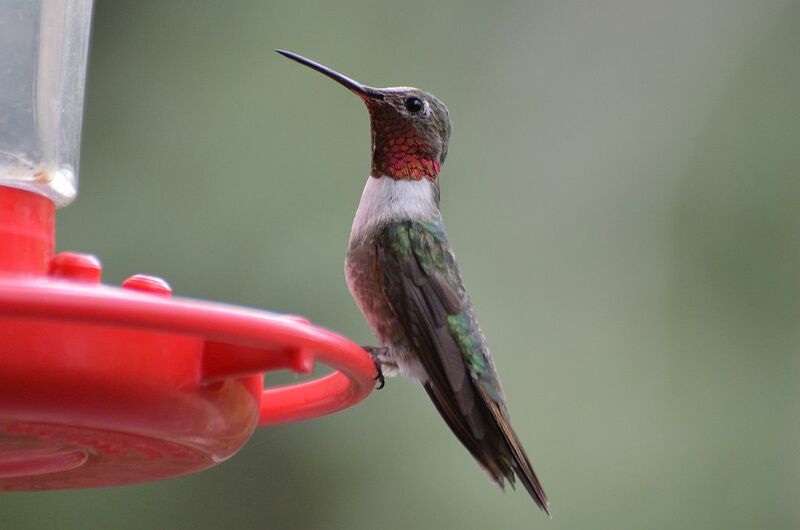 The restaurant has three hummingbird feeders and they seemed to be fairly busy with hummingbirds while we were there. 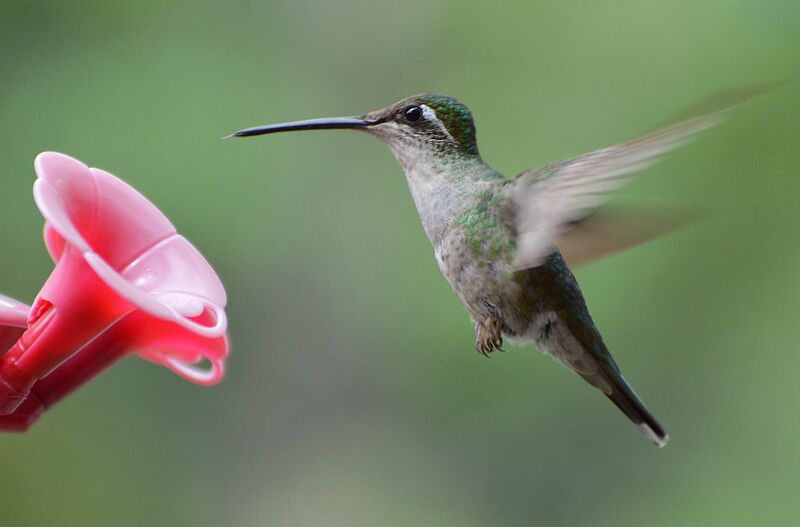 They have a veranda where you can have a nice lunch and watch the hummers. The Steller's jay and the junco were perched right across from the veranda, so photography was a snap (no PUN intended). 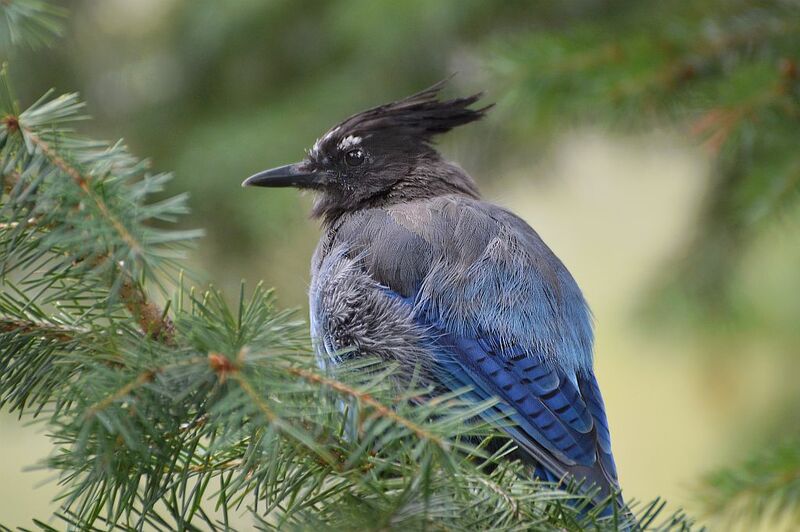 The jay photo was so close that the image is full-frame with no cropping. Concerned citizen, Krissy Kerwin (Pictured) was shocked and then very angry to see the Sandhill Cranes being fed junk food and harassed by others. This pair of cranes have been returning to the North side of Jackson for years. They nest in the wetland near Sam's and bring their young out to meet the public every year. Karen Richards (Owner of Culver's) said "That in the Spring the male crane (when the female is pregnant) is very aggressive and pecks the heck out of black cars in which he can see his reflection and thinks it is another male. They have been known to come to the front door and drive thru windows and peck constantly on the glass. They seem to be on a schedule for I know what days they will appear at Culvers. The group walks in the street and even up to the busy Buddy's Gas Station. 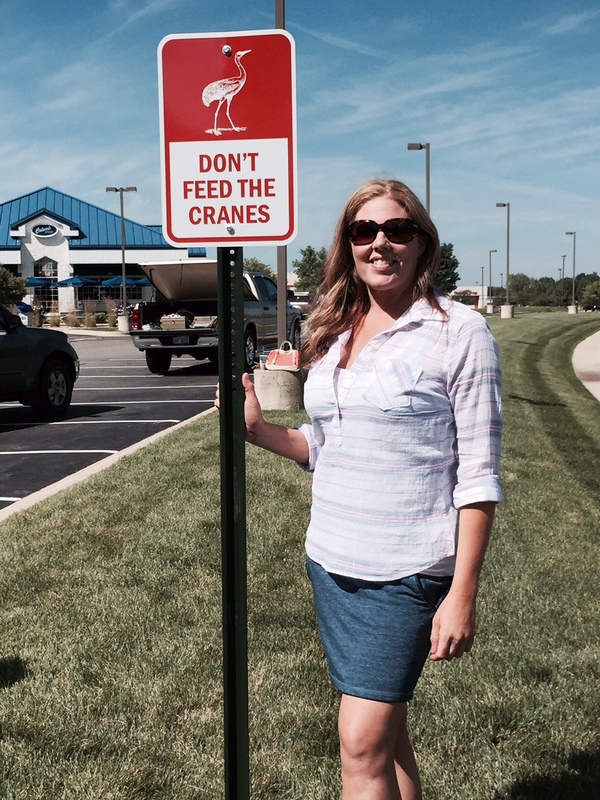 Krissy jumped into action and called Jackson Audubon, so with her donation along with Jackson Audubon and Derek Dobies (assistant mayor) the six Do Not Feed The Cranes signs were ordered. 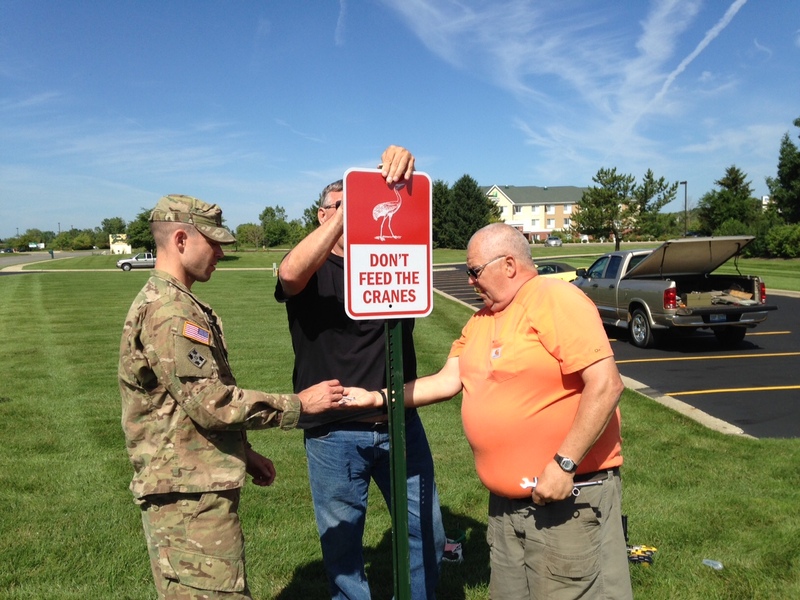 This past summer the signs were placed at Sam's, Sav-A-Lot Foods, Culvers, Cracker Barrel, and Buddy's Gas Station. 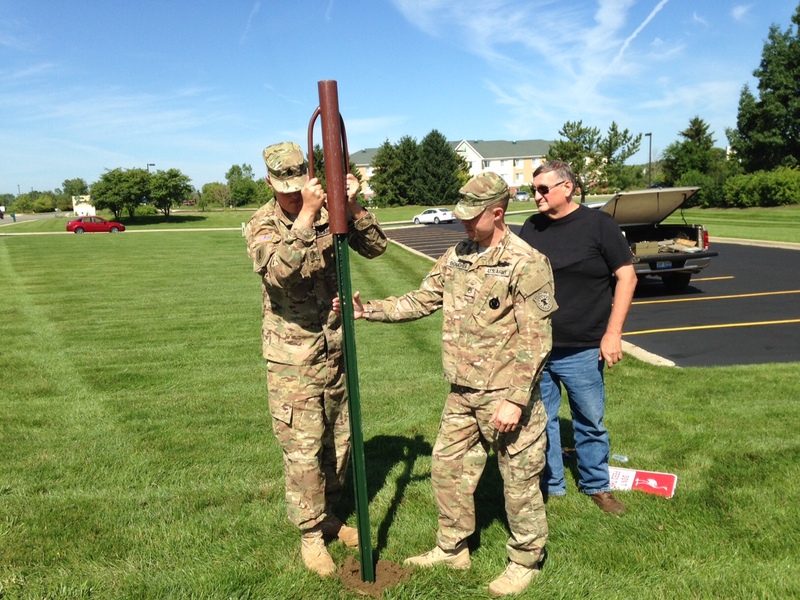 Eleven people showed up to help including two guys from the Army, Blackman Township Supervisor Pete Sancek and several Audubon members. Thank you to all that helped and Culver's for giving us a free lunch. Thank you Krissy for caring and organizing this project. One person can make a difference. The project made the news so hopefully this will take care of the problem.